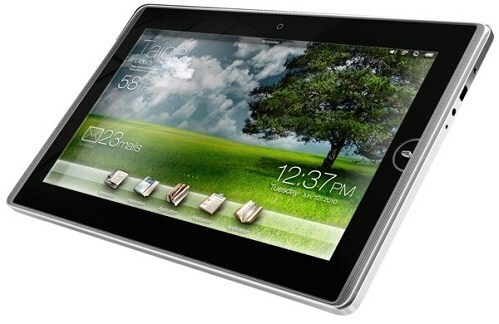 ASUS launched the ASUS Eee Pad EP121 features an Intel CULV processors, Windows 7, USB port and an integrated webcam. EP121 12-inch tablet is actually thinner, lighter and faster than the Apple iPad. It is 12.2mm thick, weighs 1.48 pounds (675g) and is powered by an Intel Core 2 Duo CULV processor (either an SU7xxx series or SU9xxx series chip at 1.3GHz or above). In contrast, the iPad is 12.7mm thick, weighs 1.6 pounds (726g) and is powered by an ARM-based Apple A4 1GHz custom SoC design. ASUS report price range between $399 and $499. Unlike the iPad, the ASUS Eee Pad EP121 offers the great convenience of being able to be docked in landscape mode. This seemingly insignificant but rather important design aspect was one of the main reasons why many prospective tablet customers chose not to buy into the first-generation iPad. Mobile productivity is designed in a way that is best optimized in a landscape screen environment, and the only way to do this on an iPad is to purchase a $69 dollar Apple Wireless Bluetooth Keyboard which faces occasional connectivity issues with OS 3.2.